If you receive (or have already received) a free copy, please leave an review on Amazon, B&N, Kobo, Goodreads, LibraryThing or Smashwords. A review doesn’t need to be long. It can be just a few sentences and it’s greatly appreciated. Thank you. Like most dystopian societies, in New Hope City corruption is endemic. But it’s not just the police, city officials and the villains that are corrupt. Corruption infects everyone, even those who try to do good. Corruption is like a fast spreading cancer that will completely consume its host if not stopped. In this type of a society a do-gooder might help the poor but only after they fatten their own wallet and belly. In this type of society a parent will exploit their own child. In this type of society, gangsters own the politicians. And it is corruption that ultimately destroys the society. Join our mailing list for writing updates, freebies and discounts. Societies experiencing a creeping collapse are filled with people who have no vision for the future. They are incapable of preparing for the future because they don’t really believe there is a future for which to prepare. Every action is about immediate satisfaction. In these types of societies the education of youth is abandoned, infrastructure is never developed and there is no preparation for future generations. In New Hope City many residents give lip service to the future but few truly make an effort to build towards it. Cynicism is a city motto. Real life post-apocalyptic societies often isolate themselves from the outside world. Even if they don’t physically erect walls, they may ignore the world around them. They become insular, only concerning themselves with what’s happening within their city, neighborhood or family. In societies in the later stages of collapse, they may even ignore what’s happening right outside their door, instead choosing to focus on themselves and their immediate family. In New Hope City crime is out of control because no one wants to get involved. No one considers victims of crime their problem. And in some cases they blame crime victims for their own suffering. DYI justice, more commonly known as vigilantism, eventually supersedes official law enforcement channels in a collapsed society. The people not completely consumed by corruption may choose vigilantism to get the justice they want but can’t find through normal channels. In New Hope City there is no justice through the police department or the court system. While the police and court system exist, they don’t function properly. And it’s with this system’s collapse that Sunni Brown’s story begins. In New Hope City I tell the story of a teenage girl living in a collapsed society and I explore how this post-apocalyptic world impacts her interactions with others and the choices she makes. 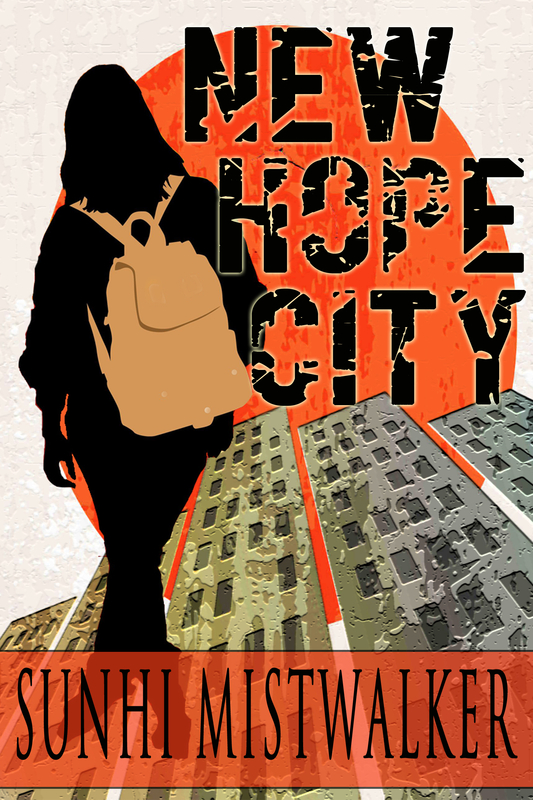 New Hope City is a full-length novel written for adults (not YA fiction). While I think the novel is appropriate for mature teens 16 years and older, parental guidance is advised. Available on Kindle, Nook and Kobo. Other formats coming soon.